DETROIT — Starling Marte dropped down a sacrifice bunt in the fifth inning of Pittsburgh's game against Detroit. Not exactly the norm for the slugging outfielder — but a sign of how much he's struggled early this season. Later, with the score tied in the 10th, it was time to swing away. 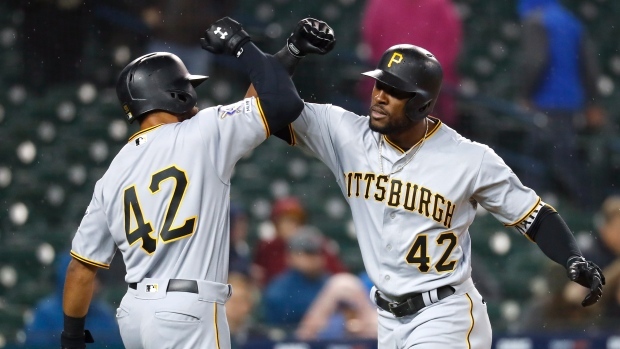 Marte's two-run homer lifted the Pirates to a 5-3 victory over the Tigers on Tuesday night. It was only the second home run of the season for Marte, who is hitting .213. "You saw him take the game in his own hands earlier and put down a bunt. There's no bunt sign on. He wanted to bunt," manager Clint Hurdle said. "He put down the bunt the one time, and then had a couple punchouts. And then, what a sweet swing." Jung Ho Kang also went deep for Pittsburgh, which blew a 3-0 lead but recovered to win when Marte hit a two-out drive off Shane Greene (0-1). Detroit's closer hadn't allowed a run all season. "Breaking ball," Marte said. "Slider, I think. Gave me a pitch right in the middle. Didn't try to do too much. Just tried to hit the ball up the middle." Keone Kela (1-0) gave up a tying single by Jeimer Candelario in the ninth, but Nick Kingham was able to close out the Tigers in the 10th for his first career save. Pittsburgh starter Joe Musgrove permitted his first two earned runs of the season but was otherwise impressive. He yielded six hits and a walk while striking out six in seven innings. Tigers starter Matthew Boyd struck out the side in the first but eventually allowed three runs in seven innings. Pittsburgh opened the scoring on an RBI infield single by Pablo Reyes in the second. With runners on first and third and two outs, Reyes hit a weak grounder to first baseman Miguel Cabrera, who looked to throw to second for a force, only to realize he had no play there. That initial reaction also cost him any chance of a play at first. The Tigers wasted an opportunity in the third when Gordon Beckham hit a leadoff double and Grayson Greiner followed with a single. Beckham was sent home on Greiner's hit and was thrown out at the plate by Reyes from left field. "When the ball is hit to the left side, you freeze for a second to make sure it gets through, because you don't want to run into an out," Beckham said. "We wanted to force the issue and he made a great throw." Kang's two-run homer in the fourth made it 3-0. He's just 6 for 42 on the season, but two of those hits are home runs. The Tigers scored two runs in their half of the fourth. Cabrera came home on a passed ball, and Christin Stewart hit an RBI double. Musgrove had allowed no earned runs in 15 1/3 innings entering the game. Pittsburgh closer Felipe Vázquez, who pitched two innings at Washington on Sunday, was given the night off. Josh Harrison, who went from the Pirates to the Tigers in the off-season via free agency, went hitless against his former team. "I've got guys over there that I played with, a lot of good friendships, but there's no added motivation or anything," Harrison said before the game. "As far as I'm concerned, they're another opponent — trying to win a series." Detroit also added former Pittsburgh infielder Jordy Mercer, but he's on the injured list right now after straining his quad. Pirates: Reinstated RHP Kyle Crick (right triceps) from the 10-day injured list and optioned INF Kevin Kramer to Triple-A Indianapolis. Tigers: Nicholas Castellanos (toe) played for the first time since Wednesday, going 1 for 5 as the DH. Pirates: RHP Trevor Williams (1-0) starts Wednesday night in the finale of this two-game series. Williams threw six no-hit innings in a win at Detroit last April. Tigers: Spencer Turnbull (0-2) takes the mound for Detroit.